Humpty Dumpty hasn’t been put back together yet, thirteen years after the US invasion. By any measure, the preliminary results of Afghanistan’s runoff vote in the 2014 presidential election, released yesterday, were a shock and a surprise. In the first round, held April 4 among a plethora of candidates, Abdullah Abdullah and Ashraf Ghani emerged to face a runoff on June 14, and in that vote Abdullah led Ghani by nearly 900,000 votes, winning 2.97 million votes to Ghani’s 2.08 million. But the results announced yesterday turned everything on its head, with Ghani credited with 4.86 million to Abdullah’s 3.46 million. Surprisingly, too, turnout in the second round, 7.95 million, surpassed the turnout in the first round, 6.60 million, by well over a million additional votes. Needless to say, Abdullah isn’t pleased, charging fraud and threatening to declare himself the winner anyway and lead a parallel state. Virtually everyone involved from the outside, including the United States and the United Nations, is urging calm and patience, noting that the results declared on July 7 are only preliminary, and that final results will be released on July 22. Maybe. But massive protests have erupted. And, in the meantime, anything and everything can happen: hundreds of thousands of votes, or even millions, could be thrown out in the course of an investigation, and it’s anyone’s guess who’ll be the ultimate winner—but right now Abdullah is facing a steep uphill climb. The nice, neat and tidy results that Washington was hoping for, leading smoothly to a new government and the implementation of the strategic accord between the United States and Afghanistan that was worked out earlier this year, is up in the air. Parallel with the ugly civil war in Iraq, it’s increasingly likely that Afghanistan, too, could face fragmentation and civil war later this year or in 2015, with the Taliban-led insurgency only one factor. 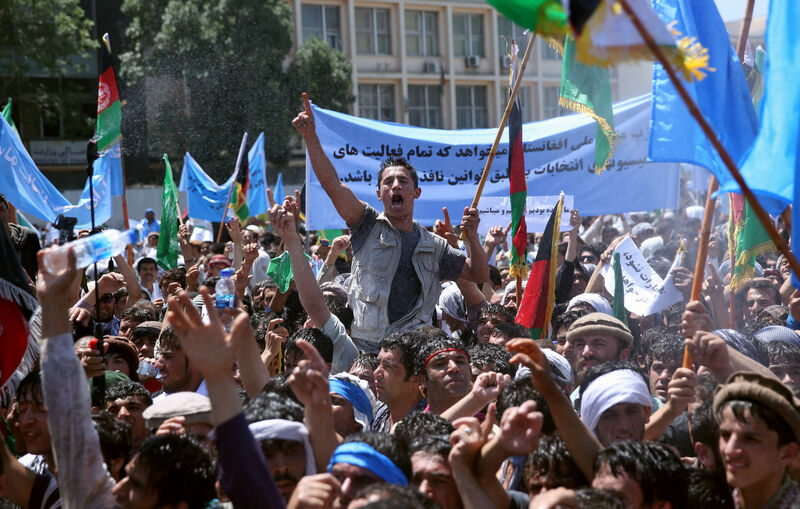 I have noted reports of protests in Afghanistan and of suggestions of a “parallel government” with the gravest concern. The United States expects Afghan electoral institutions to conduct a full and thorough review of all reasonable allegations of irregularities. At the same time, there is no justifiable recourse to violence or threats of violence, or for resort to extra-constitutional measures or threats of the same. The apolitical role of the security forces must be respected by all parties. We call on all Afghan leaders to maintain calm in order to preserve the gains of the last decade and maintain the trust of the Afghan people. Any action to take power by extra-legal means will cost Afghanistan the financial and security support of the United States and the international community. Despite its waning influence, the United States has a lot of muscle because it, and the rest of the international community, provide virtually every dollar of Afghanistan’s budget, including cash to keep its military afloat. But that may not be enough to keep Afghanistan together if the various factions, and the warlords, can’t agree on who’ll get the biggest slice of the pie when the final (adjusted) election results are announced. As late as December 2013, the international community knew that there were over 19 million voter registration cards in circulation even though there were only 11 million registered voters, but did not feel compelled to act. It is important to highlight, however, the fact that there has been fraud in this election is no surprise to most credible analysts. But the level of fraud is so significant and surprisingly efficient, that it has surprised even the most cynical pundits, pointing to perhaps a widespread use of the Afghan election instruments (i.e. the Independent Election Commission, or IEC, and the ECC) to facilitate this fraud. There is little doubt that Ghani was able to mobilize Pashtuns in the East. Ghani claims he was able to do so by calling upon tribal leaders and mullahs to mobilize voters in their communities. For weeks before the second round of the presidential election, Ghani proudly touted the support of tribes. His twitter feed produced an endless stream of tribal “leaders” promising to deliver the votes of entire lineages. A…development which tarnished the legitimacy of the IEC transpired when its Secretariat Chief, Zia-ul-Haq Amarkhail was stopped by the police chief of Kabul for attempting to transport unused ballot material out of the IEC headquarters after polling had ended. His attempt was broadcast live on Afghan television and the incident sharpened widely held fears of electoral fraud. In the aftermath of this development, neither the IEC nor Amarkhail could offer a reasonable explanation to clarify his actions thereby generating suspicion that the unused ballots were intended for fraudulent use. The IEC’s initial refusal to suspend or investigate its head of secretariat resulted in Abdullah’s team to cease its cooperation with the IEC and called for U.N.-led mediation. Furthermore, Abdullah’s team appears to have devoted its resources to unveiling Amarkhail’s (and by extension the IEC’s) role in electoral fraud. The latter came to light on 22 June during a press conference from the Abdullah camp where they played intercepted mobile phone conversations that allegedly implicated the Secretariat Chief discussing ways and means to trip the electoral process in favor of the rival presidential candidate. While the audio recordings have not been verified for their authenticity, their release has intensified the political crisis and has cast a fear that tensions might escalate and lead to violence. Since this incident unfolded, Amarkhail stepped down from his position and “strongly rejected” the accusations made against him. Making matters worse, new reports indicate that Amarkhail quietly left Kabul on a flight bound for Dubai. It is unsurprising that such precarious events have failed to inspire confidence or rebuild trust for the IEC in the public’s viewpoint. In any case, poor, battered Afghanistan will have to negotiate once again a bitter, contested and perhaps violent battle over election results and then hope that it’s corrupt and venal politicians and warlords can come to an accommodation about what the next government will look like. And the man who’s been in the middle of it all for the United States, James Dobbins, the special envoy for Afghanistan, will soon be leaving his post, to be replaced by Daniel Feldman.